Samsung might have some of the best smartphones and tablets on the planet, but there’s nothing to stop you beefing up their appeal even more. In fact, there are accessories galore for all types of Samsung gadget and they’ll give your device an added touch of practicality or another lease of life no matter where you use it. From super-slick headphones through to wireless charging gizmos, portable speakers and more, we’ve got a dazzling array of the best Samsung accessories that’ll let you squeeze even more from your shiny smartphone or tablet. There’s something to suit any kind of budget, while any or all of them also make great gift ideas if you’re stuck for some new tech to buy. Boost your productivity with this very cool Wacom Bamboo Stylus Feel stylus design. It’ll work with a raft of touchscreens such as the Samsung Galaxy, has a finger-friendly ergonomic shape and a mesh tip for durability, while there are four replacement nibs in the box too. If you’ve got a Samsung device and want to stay firmly on-brand then try a pair of these ‘phones. With their gold finish they look the part, plus they’re super comfortable and deliver up to 10 hours of music playback or 11 hours of voice call time. Bluetooth means no cables either. Fancy a full keyboard and touchpad experience on the move? Well, this neat little folding gizmo will deliver just that. It can be hooked up to all manner of devices, including Android OS-fuelled Samsung gadgets and the Bluetooth design sports a rechargeable lithium-ion battery. Compatible with the Samsung S8 and S8+, this wireless fast charger is great to look at and comes with the benefit of being an official Samsung accessory. It’s got a compact design that’ll fit in anywhere plus you can use your device in portrait or landscape mode, while it’s being powered up. The leather-felt finish looks and feels quality too. These KEF in-ear headphones are the business if you want superior sound quality but don’t want the bulk of conventional bins. Lightweight, unobtrusive but with a colour scheme and design that’s great on the eyes, these snug beauties will also shut out noise around you. The cool, clean lines and lightweight design of this Bluetooth speaker means that it’s perfect for tunes on the go. There are no cables, it’s splash resistant and comes with a carrying strap if you’re travelling really light and are happy to have it hanging around your wrist. This cool gadget will provide wireless charging for the Samsung Galaxy Note 8, S8, S8+, S7, S7 Edge, S6 Edge Plus and Note 5. It’s a versatile beast that boasts a premium design too while the plug and play functionality and LED charge indicator make it a breeze to use. These cool high-end Mujjo leather gloves will let you get the best from your Samsung touchscreen no matter what the weather’s like. Manufactured from sumptuous Ethiopian lambskin and cool Egyptian cotton they’re perfect for fingertip control of your functions and they look the business too. Need warm, on-trend gear to go out in the cold this winter? This mini speaker system isn’t just an ideal pairing for any of your Samsung gadgets as it’ll also partner nicely with all Bluetooth-enabled devices such as the iPhone and other smartphones and tablets. Battery-powered, it weighs in at just 180 grams too. 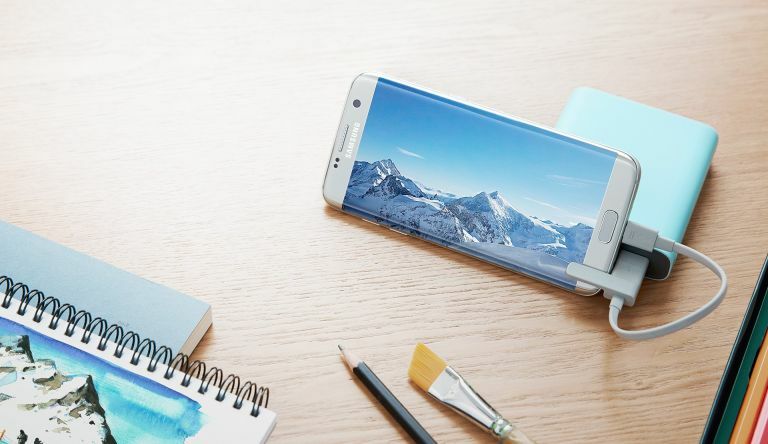 This very cool little wireless charging stand works with the Samsung Galaxy S7, S7 Edge, Note 5, S6, S6 Edge and S6+. It offers rapid charging with your device in the portrait or landscape position so it doesn’t interfere with your activities, while the design itself will look good in any room of the house. This stylish Samsung Evo 10,200 mAh rechargeable battery pack comes in Baby Blue or Baby Pink and can be mated to this neat little USB LED light accessory that can be purchased separately. There are USB ports and a cheaper 5100 mAh option if your power requirements are less demanding. A supplied wrist strap means you’ll never lose it. If you’ve got a Galaxy S8+ and hanker after a traditional keyboard layout then this practical QWERTY layout will fit the bill. It attaches to your handset and lets you enjoy all of the keyboard options found on a standard layout, but in miniature. A bit like our earlier Mujjo gloves example, you’re not just limited to using these premium leather touchscreen gloves with Samsung gadgets as they’ll work with almost anything. Wind and waterproof, they come in a range of sizes and allow you to stay productive, no matter what the conditions are like outside.